I'll confess to not being a big fan of coffee-table books; pictures of animals and exotic places are okay and appreciated in certain contexts, but outside of those two subjects, I'm usually not much enamored of large picture books collecting dust on a tabletop as a snooty bit of decor. And that goes double for math and science books pretending to be table-toppers… I want to read and ponder math and science, more than I want to stare at pretty pictures, so I'm always a bit skeptical of coffee-table-like books that approach these subjects... and appropriately such books are a bit rare. Having said all that, I have another confession to make: I'm a sucker for geometry!! 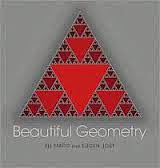 ...My initial thought when I first glanced at the new volume "Beautiful Geometry" was, "oh good a new Alfred Posamentier book! "… but it isn't from Dr. Posamentier; it is from Eli Maor (and artwork by Eugen Jost), another fabulous math-popularist. And if I owned a coffee table (I don't) this is a volume I'd be very pleased to plop upon it! Princeton University Press has done its usual splendid job of presentation with this large striking offering of indeed beautiful geometry (beginning with the gorgeously-rendered cover of a Sierpinski triangle -- which, though you might not recognize it from that cover, is characterized by the delightful fractal paradox of having an infinite perimeter bounding an area of zero!). I could be mistaken, but it seems as if the wide popularity of Clifford Pickover's "The Math Book" has spawned a mini-proliferation of these sorts of artsy-math compilations, that combine math text with eye-catching art and graphics. The artwork in this volume is consistently exquisite -- sometimes its meaning being clear and obvious, and other times requiring closer examination or pondering. Maor's text is excellent (and very accessible) as well, and does raise the volume above the level of a mere look-see coffee table book -- you can definitely learn some interesting and real math along the way, which is beautiful in its own way, apart from the artwork. Although the topics covered (over 50 gems) run mostly in chronological order, you can easily hopscotch around the volume jumping to topics which interest you most, or which are new to you. Of course there are many classic bits of plane geometry included here, but also some subjects that might be less familiar to many readers, like "Ceva's theorem," "Steiner's prism," "Lissajous figures," and the "Reuleaux triangle." It's not often that math books can be described as "delicious," "scrumptious," or "delectable," but such words fit in this case, or, as Ian Stewart calls it, "a feast for the eyes." Mind you, you're average neighbor who stops by for a beer on Sunday afternoon may not be much moved by these pages, but for math enthusiasts and especially young people delving into geometry this is A BUY! Geometry has, perhaps, never been rendered more beautifully! From indications I've seen, it looks like another banner year ahead for popular math books (this particular volume is scheduled to hit bookstores around end-of-January)… I can't imagine it can equal 2013, but there's some great stuff coming down the pike (the one I'm currently most anticipating is Max Tegmark's "Our Mathematical Universe" due out in a couple weeks). Yeah, I'm already likin' the looks of 2014! So a Happy New Year to all! !, as MathTango, which started as an experimental offshoot of Math-Frolic, essentially completes it's first year of postings. "The high-school English curriculum teaches both the grammar and the poetry. Why can’t a high-school mathematics curriculum teach the poetry and artistry of its discipline as well? "The goal of this site is to demonstrate the beauty of mathematics, its wonder and its intellectual playfulness, and to work towards bringing true joy into mathematics learning and mathematics doing for one and all." Dr. James Tanton might be deemed one of the 'rock stars' of math cyberspace. I first learned of him (as I suspect many did) when Sol Lederman of Wild About Math began drawing attention to his work (p.s. : Sol podcast-interviewed Dr. Tanton over a year ago). He is one of the most creative, thoughtful educators on the Web, and you can sense the joy he draws from math whenever he presents the subject to others. 1) When did you know that you wanted to do mathematics professionally, and can you give a brief synopsis of your life's road to your current math duties? I found mathematics in school dreary beyond belief, disconnected, and joyless. I knew I could do the work asked of me, and I did it well, but it was primarily procedure and rote doing in an unenlightened curriculum experience. I was never really interested in "what" questions ("What is the height of a tree viewed at an angle of elevation on 34 degrees from 60 meters away?" "What is 76622 divided by 13?" "What is my monthly interest payment if I take out a loan of ....?"). I was much more fascinated by "why" questions,and really loved to ponder the "what if" questions too. But I was well-trained not to ask these sorts of questions, and thus understood mathematics to be about technique and algorithm and computation. Abstract algebra was all about the "whys" and invited many a "what if." I was dumbfounded and delighted by this, that this is the sort of thing mathematicians really think about. I felt I was "home" with this material. SO ... I finished up my theoretical physics undergraduate degree, switched over and did a pure mathematics "honours degree" (Australia offered three-year undergraduate degrees, with an option to extend to a fourth honours year), and then headed over to the U.S. for a PhD in mathematics at Princeton. But I decided not to pursue the pure high-powered research route in mathematics. I've always felt a call for teaching, which, I understand now, is actually a call for sharing the "joy" -- to do whatever I can to share with the world the joyful, and mind-blowing, experience thinking about, pondering on, and doing mathematics can bring. I taught at liberal arts colleges for phase one of my working career, somehow fell into doing a great deal of consulting work for high-school and middle-school educators, and then realized that I didn't really know what I was talking about when advising on matters of K-12 mathematics curriculum and education. I felt the overwhelming pull to be honest in this work. I left the college world and became a full-time high-school teacher myself. I wanted to truly understand the demands and frustrations of working as a high-school educator, to truly understand the nuances of the curriculum and of teaching that curriculum to young students, to find the wiggle-room within the rigidity of the curriculum and the frenetic, all emotionally consuming school culture, and to truly follow my call for the "sharing of joy" at what I think is an absolutely vitally important level of mathematics education. I joined St. Mark's School in Southborough, MA. While there, I founded the St. Mark's Institute of Mathematics, which I linked with Northeastern University's School of Continuing Education. Through the Institute, I offered extracurricular research classes for middle-school and high-school students across the Boston area, gave graduate course for educators on the content of K-12 mathematics (and beyond), offered general lectures and workshops, wrote math essays, published books, and did whatever I could to share the joy of mathematics at all levels of thinking and doing. And then life recently brought me to Washington D.C.
2) You currently work with the Mathematical Association of America… what is your role and goals with that organization, and is that position open-ended or are you on a certain time-frame? I was absolutely delighted and honored to have been offered a visiting position at the Mathematical Association of America. Word seemed to be out on the street that I was moving to the city (my fabulous wife is a top-notch planetary geologist and was offered a plum job here) and this position was basically waiting for me upon my arrival. It has since turned into a long-term open-ended position and comes with the stunning title of "Mathematician in Residence." The MAA has long been interested in matters of good quality, joyful, mathematics at all levels, and joyful education, at all levels. Of course, its primary focus is on supporting work and education at the undergraduate level, but that is not its only focus. For over 60 years, for example, the MAA has been supporting the American Mathematics Competitions for middle- and high-schoolers. My position at the MAA is only half-time. I do a lot of travel and consulting work now, workshops, talks, lectures, short courses, etc for educators and students across the nation, and I am happy to promote the work of the MAA as I do so. I also have started the "Curriculum Inspirations" project with the MAA to show how the content developed by the AMC is relevant for the classroom, connects beautifully with the Common Core State Standards, and, most important to me, how each "what" question asked in those competitions is actually an invitation to deeper thinking into the "whys" and "what ifs." I make videos and write essays about how to see each concrete piece as a portal to joyful wonder and further exploration. The AMC content is not really about competition at all. (Any sense of competition turns me off, and would have done even more so as a student). The AMC is really about innovative thought and play of ideas. "Curriculum Inspirations" is about that. I should also mention that the doors of Math for America, DC, were laid open for me too upon my arrival here at DC. (Amazing!) I do the professional development work for all their fellows. 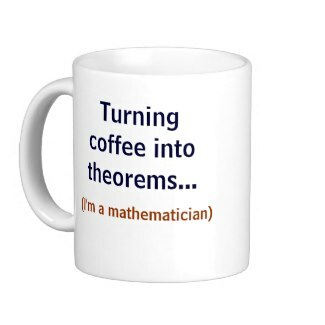 They have such a wonderful program and are truly influencing the local departmental cultures of mathematics teaching - making joy, personal understanding, personal confidence, the willingness to rely on one's wits to "nut things out," the top goal for students in their teaching. 3) You have a PhD. in mathematics (from Princeton, no less), but your interest seems to have always been focused on secondary education (not college instruction)… can you say a little about the dichotomy between college and secondary level math and what draws you to the latter? And do you foresee ever teaching again at the college level? Having spent basically ten years as a college professor and ten years as a high-school teacher, I feel I have my "creds" in both worlds now. These two cultures, in the past, really haven't talked to each other in meaningful ways. (I remember many a college department meeting complaining about how high-school teachers don't teach this or that, of if they do, they don't teach it in the way that is true to mathematics.) Part of my mission of "mathematics joy" is about connecting these two worlds. I feel I truly sit between the two now. I don't know where I'll be in ten years' time, but this in-between spot is a powerful and helpful place to be. College departments talk to me, high-school departments talk to me, and I feel I can speak to both with understanding and, more important, offer actual concrete ideas that might be of help. And all through this, I am drawn to the high-school level education as the place that really can't afford to forget about the idea of "joy" in mathematics. 4) I think you are likely regarded as one of the most astute instructors of math on the Web today… Is that just a 'natural' talent that you've always had, or have you had to work hard at it and change your approaches over time to find what works best with students and on the internet? The honest truth is that I don't think too hard on what I do. Well, that's not quite true. I believe in "mulling" -- so I mull a lot. When I think of a topic in the curriculum, my guiding principles are "get rid of the clutter" and to ask "What is really going on?" My ultimate goal as an educator is to teach kids the confidence to rely on their wits, to be confident enough to try something., to get it wrong, to flail, to turn flailing into "successful flailing," make educated guesses, to find successes, and enjoy the success (and then wonder about more!) Life comes with no answers in the back of the book -- I have no idea how to do most things I encounter in life. Success in business and in research is about flailing, asking new questions, and getting things wrong most of the time. So when I look at a curriculum topic and ask "What is really going on?" I am really asking: "What are the key one or two ideas that make this topic click - so that the rest just follows as common sense?" I ask this because it is the reliance on common sense I want to teach. Of course, when I do teach a topic, I do get a sense of what works well for students and what not so well and I do make adjustments and tweaks. 5) You're a native of Australia… do you see any significant differences (pluses or minuses) between secondary math education in your home country and here in the U.S.? 6) Can you summarize where you think the future of secondary math education is headed in relation to digital resources, especially in regards to 'Khan Academy' type sites and the interest in "flipped classrooms?" And might something along the lines of "MOOCs" ever apply at the secondary education level? I would love students to enjoy a sense of control of their own leaning in the classroom (and, therefore, classroom cultures with the flexibility for that), so that if a student really is struggling with a topic, or wants to fly with a topic, he or she has the time and mental space to make use of the online resources out there to pursue it. I would like to see homework change from "Do these 40 problems on logarithms" to perhaps something like: "Do enough of these problems until you feel you really get it. And then do just one more, the one in the rest of the list that looks hardest to you. When done, if there is still time, look at some of these videos and tell me something interesting about logarithms you saw." Even though I am failing to give a meaningful response to this question, I obviously have some thoughts on the matter re the videos I make and the short courses I have started posting on line. I've always said to myself that these are for educators, for their own personal enrichment and rekindling with a love for mathematics, and that they are for students too. But have I ever thought through how and when students might use these resources? Hmm. I do know that a number of educators have shown my videos in their classes, or have assigned them as viewing for homework. And I like this idea in general, this flipped classroom idea. I will predict that that, at least, will happen more and more often in the years to come. 7) What are your own favorite aspects of mathematics to study or read about? And are there any particular books you'd especially recommend to the lay person with an interest in math? But I really do have a love for number theory. As Mr. Honner says, I am overly obsessed with triangular numbers. Read the works of Bill Dunham. He's a super guy who writes with great clarity on matters of history of mathematics AND the mathematics itself. Speaking of mathematics history: "Math through the Ages: A Gentle History for Teachers and Others" by Berlinghoff and Gouvea is a gem. "Mathematical Circles: Russian Experience" by D.Fomin, et al, is a brilliant guide of fascinating and beautiful mathematical ponderings. "The Queen of Mathematics: A Historically Motivated Guide to Number Theory" by J. Goldman gets a tad advanced, but it is brilliant. 8) You've written a number of excellent books which are available through Web sources but not otherwise widely distributed. I'm curious if that is by your choice, or some other reason a traditional publisher has not taken them up and given them a wider audience? I am hopeless at self advertising! I have really enjoyed the flexibility of self-published books. They are all "charmingly human" (meaning, that they have never been copy-edited), but if ever I find one chapter is a bit too "charming" I have the means to quickly re-upload a corrected chapter and the issue is dealt with. And I love the complete control I have on what I write and how I present it in my self-published pieces. Plus, despite not advertising these things, my self-published pieces do sell at a fairly constant rate - and that's lovely and helps support the work I do. I have published three books the traditional way and have never really felt they reached a good market. Somehow I have a sense that my my self-published books are "out there" more so than I can detect with my company-published books. I find that curious. 9) When you're not bringing the joy and wonder of math to young people, what are some of your other main interests/hobbies/activities? I would like to say border collies. My family and I have always had border collies in our lives (and my wife is a trained sheep herder too! ), but it has been a sad year this year as our three dogs all passed on. With the amount of travel my wife and I each do, it is actually easiest being dogless right now. But it feels oh so wrong! Apart from that, family and math really is about it for me. And that's pretty darn good! 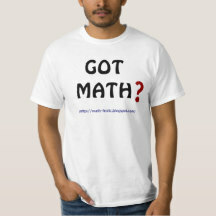 [Well, we share sweet-tooths and a love of border collies... now if I could just acquire your talent for math! Hope everyone enjoyed learning more about Dr. Tanton and his approach to math and instruction, as much as I did! Anyone up for some philosophical reflection on a lazy Sunday morning...? Vocal math Platonist Martin Gardner famously wrote that if 2 dinosaurs met 2 other dinosaurs in a clearing, there would then be 4 dinosaurs present… whether or not there was any human mind around to appreciate the fact, and whether or not there existed any such words as "two" or "four," the relationship would still exist completely apart from human recognition of it. In fact, Gardner (who was actually more a philosopher than a mathematician) largely scoffed at the few professional mathematicians in his day who claimed that mathematics was merely some sort of human/cognitive creation. The case against Platonism has grown since then, with fewer, though still many adherents. Non-Platonism comes in several different varieties and degrees, but Platonists tend to more uniformly feel that mathematics is a real, ubiquitous component of the Universe (or, in the case of Max Tegmark, they believe math is ALL there is -- it is ultimately the only component or structure of the Universe; p.s., Tegmark's new book "Our Mathematical Universe" will soon be out). Much of this debate continues to seem semantic, hinging on what one means by words like "real," "existence," "component," and other words that simply can't be defined in terribly rigorous/consistent ways (even "mathematics" is not that easy to define). Is mathematics 'out there' in the Universe, apart from us and our existence, or is it only inside our heads, generated from neurochemical processes? It certainly seems to me that if "science" has any reality in the Universe (and we're not just living in a simulation imposed by highly-advanced aliens) then there are elements of mathematics that must be real and integral to the Universe's operation -- if math ISN'T "real" in some sense, then "science" (which is based upon it) must also not be real, which implies that the Universe, rather than having 'order,' 'laws,' and causation as we perceive, is a rather hopelessly random/chaotic place (...which in turn assumes that "randomness" can truly exist!???)... but whether all of mathematics exists in some Platonic sense or only elements of it is more of a leap, and perhaps, as I say, more an argument over words and meaning, than mathematics itself... In any event, read Jason's take and the conversation that follows it. "I just saw a television program in which a mathematician lost his daughter. Unable to express himself in the language of platitudes that most people use at such a time, he created a series of equations to represent her life, a work of art, expression, in math. Yes math is beautiful. There is absolutely no aspect of our lives for which you will not find math at its foundation. If I have a glass of clean water today, it is because of the math behind the engineering that brought it to me. Math is the mother of all science. Without it, our lives would be incomprehensibly pathetic." You get to remove one ball at a time, but once you remove it, you must replace it with any finite no. of your choice of balls of 'lesser' rank. Thus you can take out a ball labelled (or ranked) #768, and you could replace it with 27 million balls labelled, say #563 or #767 or #5 if you so desired, just as a few examples. The sole exceptions are the #1 balls, because obviously there are no 'ranks' below one, so there are NO replacements for a #1 ball. Although completion of the task is "unbounded" (there is no way to predict the number of steps needed to complete it, and indeed it could be a VERY large number), the box MUST empty out within a finite number of steps! Once there are only #1 balls left in the box you simply discard them one by one (no replacement allowed) until the box is empty --- that's a given. In the simplest case we can start with only #2 and #1 balls in the box. Every time you remove a #2 ball, you can ONLY replace it with a #1, thus at some point (it could take a long time, but it must come) ONLY #1 balls will remain, and then essentially the task is over. The same logic applies no matter how high up you go (you will always at some point run out of the very 'highest-ranked' balls and then be working on the next rank until they run out, and then the next, and then the next...); eventually you will of necessity work your way back to the state of just #1 and #2 balls, which then convert to just #1 balls and game over (even if you remove ALL the #1 and #2 balls first, you will eventually work back and be using them as replacements). Of course no human being could live long enough to actually carry out such a procedure, but the process must nonetheless amazingly conclude after some mathematically finite no. of steps. Incredible! (too bad Cantor isn't around to appreciate this intuition-defying problem).